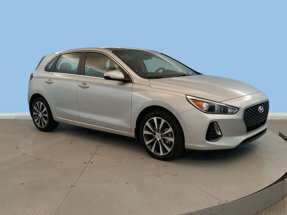 Trustworthy and worry-free, this 2019 Hyundai Elantra GT comfortably packs in your passengers and their bags with room to spare. Tire Specific Low Tire Pressure Warning, Side Impact Beams, Rear Child Safety Locks, Outboard Front Lap And Shoulder Safety Belts -inc: Rear Center 3 Point, Height Adjusters and Pretensioners, Electronic Stability Control (ESC). REVERSIBLE CARGO TRAY, CERAMIC WHITE, CARPETED FLOOR MATS, CARGO NET, BLACK, PREMIUM CLOTH SEATING SURFACES, BLACK, LEATHER SEATING SURFACES, Window Grid And Roof Mount Antenna. Treat yourself- stop by Stevenson Hyundai / Genesis NC015 located at 2325 N. Marine Blvd, Jacksonville, NC 28456 to make this car yours today!